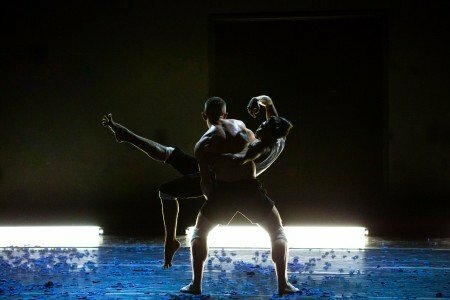 Sneakers, Bare feet, and Socks is how Artistic Director Olivier Wevers describes Whim W’Him’s latest venture with its Fall Season opener, Choreographic Shindig. 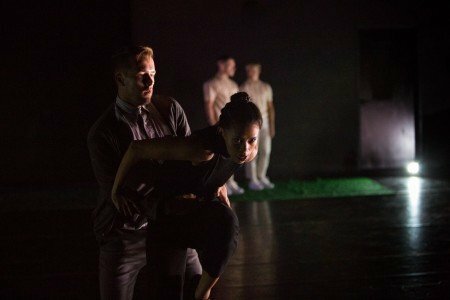 Three very different choreographers, each selected by the dancers, made newly commissioned pieces that premiered at Seattle College’s Erickson Theatre. Erickson Theatre is a space that I’ve come to really like for dance. The stage is quite large and the seats are comfortable, with clear sightlines. The theater is across the street from the 1979 Broadway Performance Hall, also part of Seattle College’s urban Capitol Hill campus. Broadway Performance Hall was built from the foundation — literally — of the historic Broadway High School, and it has been THE mid-sized venue since its opening over 35 years ago. Now Erickson Theatre is able to offer something that while not as elegant in terms of lobby space and history has what is, for me, a better dance experience. Whim W’Him returned to this venue, and I think it is a smart move. Erickson Theatre gives the audience a good experience, and because the theater seats less than Whim W’Him’s Winter and Spring home at the Cornish Playhouse, it gives the company a good excuse to run the program over two weeks, rather than only one, thereby giving the dancers more work and more performance opportunities, which is always a good thing. In terms of programming, each work was choreographically stronger than its predecessor. From Under the Cork Tree by Lauren Edson was quite good. Edson says she was inspired by the story of Ferdinand the Bull, who was more interested in enjoying flowers than being an aggressive bull. Her choreographic interpretation of this was played out by being a showcase for Patrick Kilbane [Ferdinand?] while the other dancers cavorted gently around him. Kilbane has a most beautiful classical line, and Edson took full advantage of his considerable technical skill, creating work that was easy to follow, imbued with some degree of pathos, and concluding with fine humor — the dancers all vying for the central spotlighted bow. Speaking of feats of technique, the award for sheer number of beats — entre chat [entrechat quatre to be exact] goes to company newcomer, Karl Watson, who, after standing in rélevé sous-sus for a very long while, executed 60 consecutively. I know; I counted. This was in the second work of the evening, Swan Song by MADBOOTS [aka, Jonathan Campbell and Austin Diaz], which incorporated bits from Fokine’s iconic solo made for Anna Pavlova, including Tory Peil flapping about and making “the” dying swan pose on the floor, over her extended front leg. About two-thirds of the way through this beating exercise, Watson turned from en face to effacé. In terms of composition, this was a good start, but it would have been more fun and interesting, and certainly more of an impressive feat, if the co-choreographers had continued having him complete a full revolution. Concluding these beats, they then had him made a SLOOOW grand plié all the way down to the floor, ending up prone on his side. Great control and delight. The piece really kicked in for me when the classical piano music and an all-too-brief, and not fully developed male duet began. It was lovely, lyric, and deeply expressive but too short. They only gave us a nugget while it could have been expanded and developed into something better. The program’s opening work, SARO, by Joseph Hernandez, began with a pre-show bit, with some of the dancers interacting with props, masks, and generally beginning to fill the performance space. The piece proper began with Jim Kent “interviewing” Tory Peil, her responses then becoming part of a sound score that eventually faded as other music/sound took over, as did the full company of dancers. The Peil figure seemed to be isolated from the rest, attempting to join in and sometimes being lifted. Other dancers interacted with a rolled out green carpet. Justin Reiter ended up with the whole carpet covering his blond head. This work was very demanding in terms of the stamina required of the dancers and was very well danced. I found the work to be full of imaginative movement motifs, but I was puzzled about the choreographer’s ultimate intentions. Whim W’Him continues to delight us with its contemporary choreography, giving us a different kind of dance shindig indeed. I very much look forward to their Winter and Spring shows for 2017.